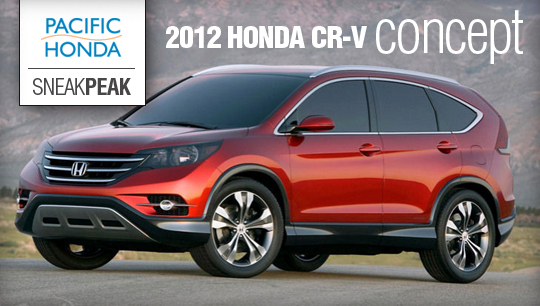 Here's a special treat... a sneak peak and the 2012 Honda CR-V concept. "The lead-up to the highly anticipated launch of the next generation Honda CR-V is now in full swing after the Japanese automaker unveiled the very first photo of the 2012 CR-V Concept. The photo hints at what could possibly be the next generation model of Honda's popular crossover." For the full article from TopSpeed.com, click here! For more images of the 2012 CR-V click here and here. Pacific Honda will keep you posted on any updates or ETAs, of course!